The case of the Chilham Mirror has been raised by Keith Parfitt, Tina Parfitt and Nigel Macpherson-Grant in a letter to Current Archaeology (231, p. 48). It was discovered by a metal detectorist in a shallow cremation grave at Chilham Castle in Kent in 1993. The material was subsequently sold at auction. 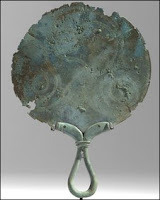 As the only Iron Age mirror to have been discovered in Kent, it is important for the study of this type of object. Only 17 complete decorated mirrors dating from the Iron Age have been found in Britain. This is one of the earliest, and is especially significant because it comes from a known context which was subsequently investigated by archaeologists using modern excavation techniques. It is not clear if the ban is still in place. The decision on the export licence application for the mirror will be deferred for a period ending on 1st May inclusive. This period may be extended until 1st August inclusive if a serious intention to raise funds with a view to making an offer to purchase the mirror at the recommended price of £35,000 (excluding VAT) is expressed. Should the mirror and two brooches (one apparently found by Parfitt, Parfitt and Macpherson-Grant "in the backfilling of the original metal-detectorist's pit") be reunited with the cinerary urn and cremated remains in the Canterbury Museum?